We all know Santa Claus is a pretty cool dude. Magical reindeer, flight, possible time travel, and a philanthropist too, we thought Father Christmas couldn’t get any cooler, but if this image is to be believed, he’s just managed it! Driving a Mark 4 Toyota Supra is a sure-fire way to earn extra Cool Points, and thanks to Simon Przepiorka of Flickr, Saint Nick’s been pictured behind the wheel of Japan’s most iconic sports car (complete with a red nose, antlers, and a Christmas tree strapped to the roof!). Head over to Simon’s photostream via the link above to see more of Kris Kringle’s whip, and you can see the Supra’s original posting here at TLCB by clicking here. Toyota’s new Supra is nearly (finally) here, but it’s got a lot to live up. Launched in 1993, the fourth generation A80 Supra was almost wildly futuristic back in the mid-’90s, and came with a naturally aspirated straight-six or a Porsche-beating twin-turbo. The 2JZ engine as it was known, became a tuner’s dream, being easily modifiable to make up to (and over) 1,000bhp. Unfortunately for Toyota it’s these highly modified Supras that people remember, not the excellent – but slightly fat – cruisers that left the factory, giving the new one an impossible task. Still, to our eyes the new Supra does look rather good, and even if it’s not there are plenty of A80’s around. 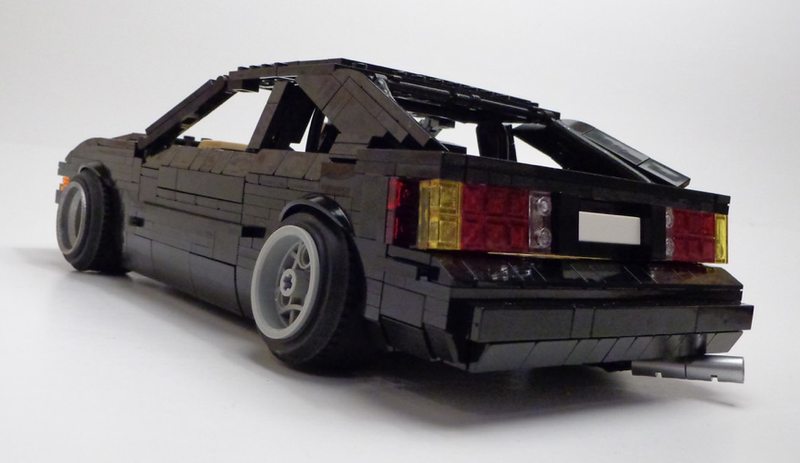 Oddly considering its status, the fourth generation Supra is a car that’s rarely recreated in LEGO form. 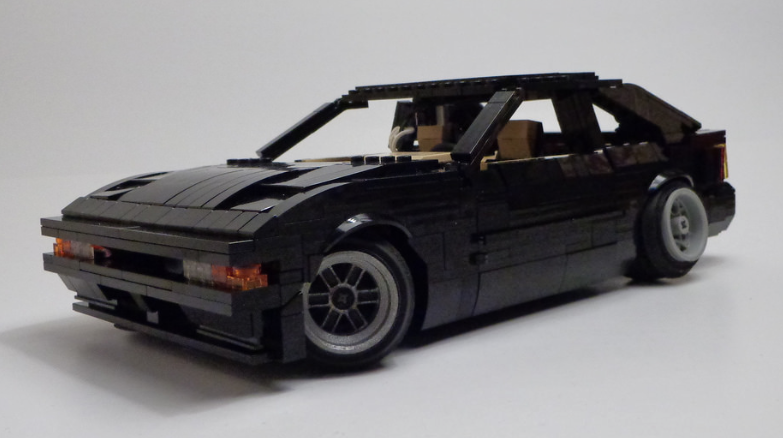 Previous bloggee Simon Przepiorka has rectified this with a superb Speed Champions scale replica of the famous ’90s GT car, which – like so many A80 Supras – is a little different from the ones that left the factory. A giant exhaust, bodykit, and a ridiculous rear wing all make appearances, and – whilst we would definitely prefer an original one (Simon?) – there’s much more to see on Flickr. Jump back to the ’90s and make ‘Bwarrrp bwarrrrp!’ noises via the link above. The Toyota Supra is a legend. Specifically this one, the fourth (and final – for now) generation produced from the mid-’90s to the early-’00s, and available with a twin-turbo straight-six that could annihilate Porsches, BMWs, and well… just about anything else at the time. Thanks to a certain Vin Diesel / Paul Walker movie franchise the Supra’s reputation has exploded in recent years, yet despite that until now we’ve never featured a fourth generation Supra here at TLCB (although earlier more humble variants have appeared). Today, with a fifth generation Supra finally nearing production after a seventeen year absence (although sadly with probably no more power than its predecessor), we finally right that wrong, courtesy of Sam the First aka Sir.Manperson of Flickr and this wonderful Model Team recreation of one of Japan’s finest GT cars. Originally built digitally (hence why it didn’t appear here), Sam has now built his Supra for real, and it looks stunning. With a near perfectly recreated exterior, detailed engine, fully appointed interior, plus opening doors, hood, and tailgate, Sam’s Supra is a testament to hours upon hours of digital designing. Why, Senator Chinchilla, why? This excellent Model Team recreation of Toyota’s Celica Supra (from back when the two models were one) features his own neat 3D printed wheels on the front, and – alas – ‘stanced’ wheels on the back. Meaning that the ride and handling – honed by a very clever Japanese bloke over the course of many months, maybe even years – has been totally ruined. Still, the Elves like it. But then they are idiots. Anyway, there’s more to see of the Senator’s top-notch* creation on Flickr at the link above.